Interceptor traps were originally installed to prevent sewer air from venting within domestic systems at a time when the authorities were unsure of the health risks and dangers that this foul air may carry, even at the time there were those who opposed the installation of the traps because they cause waste matter to sit in the outlet of a chamber until the next flush. It was therefore left to individual authorities whether they specified the installation of traps or not and for this reason they are common in certain parts of the UK on houses of a certain age, and not so common in others. They come in many shapes and sizes and the same shape of trap may be known as a Bristol trap or a Blackpool trap and no doubt a Great Budworth trap if that's the part of the country you are in. The trap shown to the right is a basic interceptor found on the outlet of a chamber with a rodding point fitted over the top to access the outgoing pipe work, in the collar end of this rodding shaft would be a clay ware cap or tea pot lid as they are known which would form a seal until access was required. However these lids would for one reason or another end up in the trap itself or they would just go missing all together creating a direct vent and defeating the purpose of the interceptor. You often find these traps to be blocked solid with the waste water flowing through the rodding point and into the outlet pipe, this can go on for years causing silt and debris to build up in the system upstream of the chamber. This is of course fine if it stops the system overflowing, however i have works on numerous property subsidence jobs where the movement to the building could be attributed to the water loss from the partially blocked system. 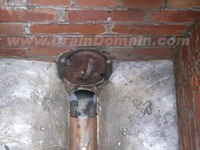 There are also chamber traps that are basically back inlet gullies that offer no access to the out going pipe work, they do however make cleaning out the trap easier than the one shown above which is handy because most of these interceptors are installed on combined drainage system and they are prone to collecting silt and debris from roofs and hard standings. Any kind of interceptor can create a problem when the system blocks downstream of the trap, a trap with no rodding point is useless when it is at the bottom of a blocked 2 meter deep chamber, it is possible to feed a jetting hose around the trap especially if it is a 150mm or larger diameter pipe however this is quite restrictive with regard to a effectiveness of the jetting unit. It is therefore necessary on occasions to have the chamber pumped out prior to breaking out the trap in order to clear a blockage. 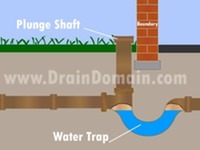 The third kind of trap shown here is an interceptor commonly found before the drainage system crosses a boundary line, instead on being constructed within a chamber the trap stands alone but has an access or plunge shaft rising from it. The image to the right shows a typical layout of such a trap and i have optimistically shown the plunge shaft rising up to surface level though in reality this is seldom the case with gardeners, landscapers and drive layers burying or concealing the access shaft. If you are rodding or jetting a system and you come to a stop at the boundary line this is usually the reason, again you can have some success in feeding a jetting hose around the trap and the access shaft lets you plunge the trap clear of silt and debris. Common defects found on interceptors include root ingress, fracturing due to movement or settlement of the chamber and a general build up of silt, debris, grease and fat within the trap itself. If the traps are causing problems we tend to remove and replace them with a straight section of pipe, this can be done by excavation or if on the outlet of a chamber it is possible to smash out the trap and install a small length of liner before making good the channel pipe and benching.